While the most visible features of a fine quality guitar are the materials and craftsmanship used in conjunction, another factor that contributes to quality are the adhesives used to hold it all together. I want everyone to know that I am not receiving any money from any of the glue manufacturers that I will talk about in this post. These are the glues I use when I make a classical guitar or on other shop projects. Here are my go-to glues. 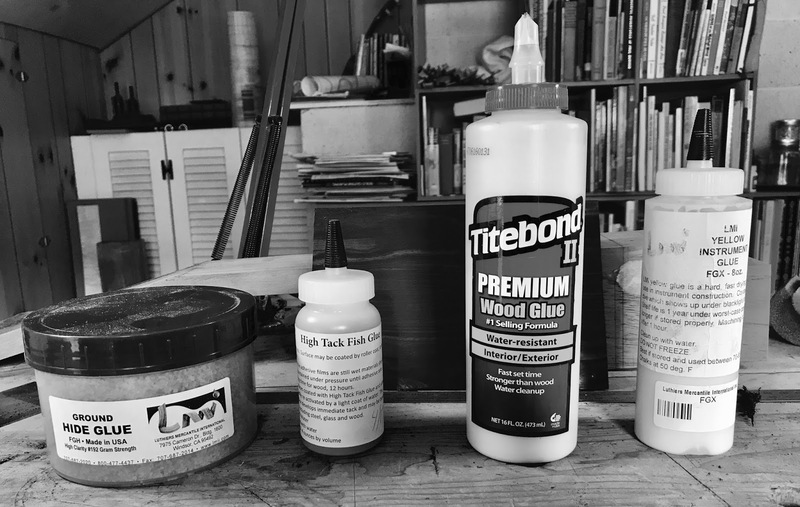 Titebond and Titebond II are PVA glues that I use for glueing the scarf joint on a guitar neck and the heel block to the neck shaft. 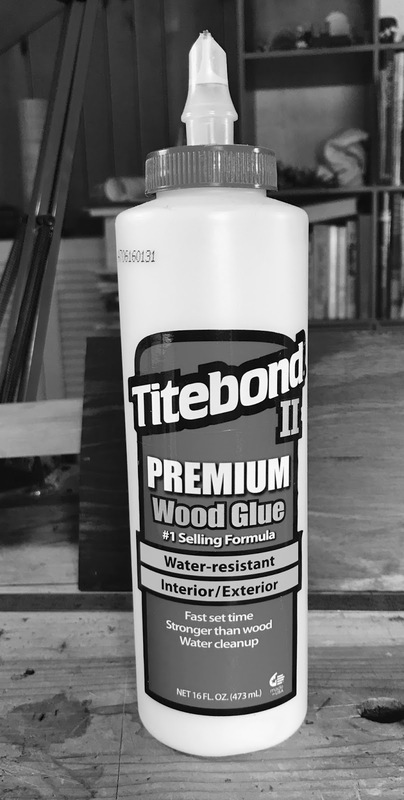 Titebond sets quickly, has gap filling properties and when I do my part on making a good joint, the glue line is almost invisible. Fish and hide glues tend to absorb the water present in shellac and can become dark making the glue line more pronounced. I also use Titebond to glue the joints for the tops and backs for the same reason. I don't want the glue line to stand out. LMI yellow glue is pretty amazing in how quickly it sets, you can mill parts glued with this within 90 minutes after clamping. It dries very hard, almost as hard as hide glue, a big consideration for string instrument makers. It is believed that hard glue joints make the transmission of energy easier and quicker, this helps that instrument sound better. The only drawback about the LMI glue is if the glue is too cold, it becomes chalky. I have found that if I use this glue when it is below 80 degrees Fahrenheit and 50% humidity, it will leave a white residue in wood pores. That makes for more work especially when using this glue on walnut or East Indian rosewood, I spend more time washing out the glue than working on the guitar. That said, it is great glue. I can't say enough good things about fish glue. I usually purchase fish glue from Lee Valley which is a high quality glue that I like very much, however, the smallest bottle is 16oz. in size and it takes me almost two years to use an entire bottle. I bought this small bottle from LMI and wow! this stuff will glue your fingers together! I use this high tack glue to glue on binding strips and sometimes, if I am not in a hurry, I use it to glue the braces onto guitar backs. 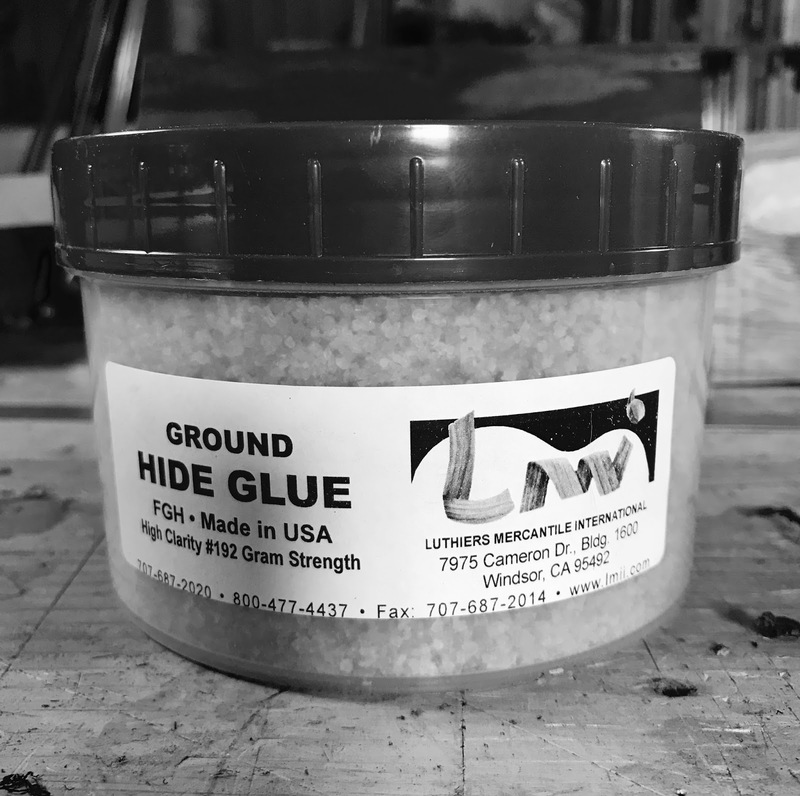 Granular hide glue is simply amazing! It has a much and sometimes more shear strength that "modern" glues and dries glass hard, again, that is better fro energy transference. I use hide glue where it really matters in guitar making - glueing the braces onto the top and back, the linings to the sides and glueing the back onto the guitar. Every wood worker should try hide glue at least once on a project. Just make sure you have a heat gun handy to warm up all the parts that will be glue together. Adhesives are what you make of them, each has their advantages and disadvantages, you need to experiment to find what works best for you and your projects. Now, turn off your computer and get out into the shop! I use hide glue and the LMI yellow glue. Great stuff! 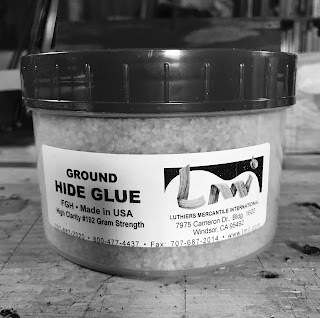 In Winter when I worry about LMI glue possibly freezing during shipping I use that much more hide glue and/or Titebond. I haven't tried fish glue yet but I think you've convinced me to give it a try! Hi, Doug! Definitely give fish glue a try! Go to https://journeymansjournel.wordpress.com, he posted about fish glue and how he came to terms with it! Good luck!